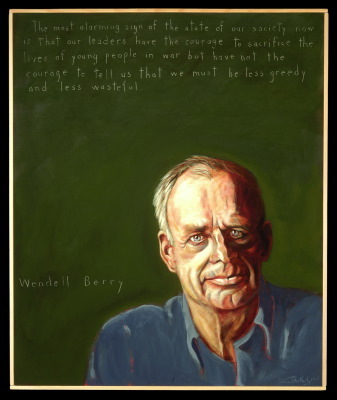 A new Wendell Berry book is always a cause for celebration, and I’ve wanted to announce this for several days. Being away, I couldn’t update BookNotes, but now am just thrilled to be writing. I really am thrilled–this is beautiful, wonderful stuff. Imagination in Place (Counterpoint; $24.00) is the latest collection of essays by Mr. Berry, and it is brilliantly conceived. In the last year or so Berry’s publishers have done a gift book reprint of the old Mad Farmer’s Liberation Front poems, a very new poetry volume (Leavings) and a children’s book, Whitefoot. To be honest, I don’t recall when the last collection of essays came out. (Was it The Way of Ignorance in 2006?) And the last several of those were about a variety of subjects, his typical anthology of writings or speeches or letters about agriculture, culture, politics, the nature of the common good, environmentalism, local eating, theology, or the ways in which daily practices of rural living can give insight about the nature of a life well lived. Michael Pollen newly edited a fabulous collection of Berry’s writing about food and eating, Bringing it to the Table: On Farming and Food, which we announced late this fall–what a great idea that was, too. Those pieces, though, were not new, and gleaned (pun intended) from his various books and publications. Still, only the most avid Berry collector would have had them all (some were from old books, some from journals or magazine pieces.) What a great idea that was for a new paperback collection. The book picks up a theme that is foundational in Berry—“imagination is particularizing and a local force, native to the ground underfoot.” (A thoughtful college student might take this up as a study topic for a thesis; I wonder how this compares to C.S. Lewis On Stories, say?) I must admit, the several chapters I’ve read in this so far have been utterly delightful and profoundly insightful. I read pages and pages out loud to Beth, laughing together at a few of his wry observations. Standing By Words is an old favorite of his, about the writing life, however this new one seems to me to be so much more interesting, less dense and more anecdotal. He tells stories of meeting authors, shares lovely details about his friendships, and tells how certain books have kept him going. One exceptionally moving story is in the chapter “My Friend Hayden” about how Denise Levertov gave him the soon-to-be-published carbon-copied pages of the first book of poetry by Hayden Carruth (who later went on to become the poet laureate of Vermont.) Berry was in considerable anguish about living in New York and as an up-and-coming writer, had friends who insisted he should stay in the high cultural center of Manhattan. Reading the poetry of a rural farmer in Vermont consoled him that his move back to his Kentucky homeland was not a bad thing. What a beautiful chapter, a chapter that illustrates well the point of this collection: the best writers are rooted in a place, and this sense of place (as it is often called) can teach us how to pay attention to our own places. In our highly mobile, late modern (or is it postmodern?) fast-paced world, staying put is counter-cultural. Berry’s deeply informed views of literature and poetry show us how to appreciate not only the authors he teaches us about, but points us to this remarkable vision of hope, hope for a place, hope for decent living, hope for God’s good world, as we nurture our imaginations. I could tell you more, but will say just these two things: the first chapter is one of the best I’ve read to understand Berry’s literary sensibilities. Other than the large collection of interviews with him, published by the University of Mississippi Press, this is a great introduction, as he tells about his interest in agrarian writers and, more, agrarian principles, and even more, agrarian practices. It is all about good farming, for him, living well on the particular plot of land you’ve got. Inner spiritual disciplines or abstract ruminations on worldview or theological principles of social justice all have their place, he might say, but it finally comes down to your literal neighborhood, your watershed, your real and unique life, here, now. His ruminations on how his fictional Port William’s characters and stories are shaped by his own membership in his real place of Lane’s Landing are wonderful to read; obviously for those who love Memory of Old Jack or Hannah Coulter or Jayber Crow will want to read this. Anyone who wants a good eye guiding you through some of the great literary voices of our age will also appreciate this with delight (whether they are firstly drawn by his localism or not.) Anybody who wants to live well, I’d say, should celebrate this kind of work. aven-bound rapture theologies to hipster nomadic lifestyles (they discuss the then little known novel by Walter Kirn, Up in the Air) to postmodern restlessness, our disregard for tradition and family and place and neighborhood and creation leads to an unsustainable and inhumane way of life. (Have you seen the new book Next Stop, Reloville: Life Inside America’s New Rootless Professional Class by Peter Kilborn? Wow!) The ideologies of capitalism and progress that drive the American way of life, impacting rich and poor alike, fly in the face of Biblical values and Beyond Homelessness, more powerfully than any, calls us to grapple profoundly with a new imagination that has eyes to see people, animals, plants and places as given gifts of grace. By using home-making metaphors, and exploring the Biblical theme of exile and the redemptive promise of home-coming, Beyond… deepens the insights of books like Al Wolter’s Creation Regained or Andy Crouch’s Culture-Making and the many good titles on creation-care and the call to stewardship and the cultural mandate. 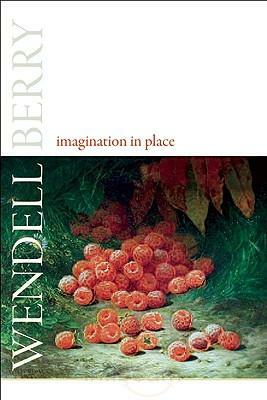 So, Imagination in Place tells of Wendell Berry’s literary influences, each who captures a sense of place, and how that particularity in poetry or novels or memoir can help us all gain new imagination, new attention, new ways of seeing, our own places. Odd, how particularity can yield such universal insights. And, then, a reminder of the urgent and rich and deep work offered as theological resource for this project of stewardly care for our places, Beyond Homelessness: Christian Faith in a Culture of Displacement by Walsh & Bouma-Prediger. Two related books, though different in style, and both very highly recommended.